Crazy Person CHOCOLATE CHIP COOKIES. Strategically Placed. You see......I have this little trick I do when I make chocolate chip cookies. I guess I never realized that no one has ever seen me do it before. Until today. When my teenage daughter walked in and caught me doing it. You see, I have this problem. Or lets say "theory". That sounds better. Theory. I believe that chocolate chip cookies look more appealing, more YUMMY, more decadent, when the chocolate chips are emerging from the top of the cookie. You know, instead of buried into the cookie where you can't see the chocolate chip. Personally, the first cookie I reach for, is the cookie that has all the chocolate chips gloriously peeking out at me. I mean tell the truth. Which cookie would you reach for first? So I have this little trick. Once my cookie dough is placed on the cookie sheet, I strategically get to work. I take my little jar of chocolate chips. And start placing extra chips on top of the dough. One by one. 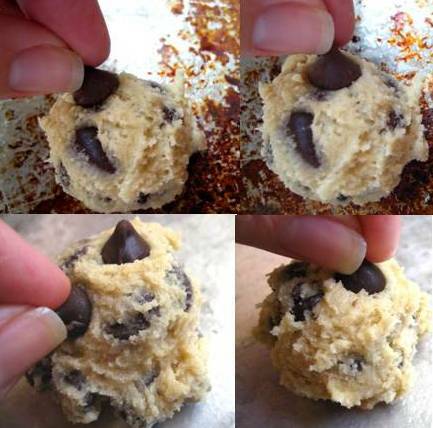 No matter how many chocolate chips you mix in the cookie dough batter, for some reason, they always stay hidden under the dough after they are baked. So I like to pretty-them-up just a bit, and I carefully hover over the cookie sheet, and place one by one, about 5 extra chips, on top of each pile of cookie dough. That's when my daughter walked in, and saw me, hunched over, strategically placing chip, by chip by chip by chip, by chip, on top of each cookie. I felt like one of those incredibly talented crafters, who paint really small detailed images on a piece of rice. I had no idea how long she had been standing and watching me. "What are you doing"? she said, in her know-it-all....."I'm-almost-20-years-old" voice. I simply explained to her my "theory". "You're a crazy person! ", she snapped at me. And off she went. Obviously to go do some non-crazy things I'm sure. Well, crazy I may be. I'm sticking to my theory. I will continue to place extra chocolate chips on top of my mounds of cookie dough before I bake them. Which cookie dough mound do you think will turn out the prettiest cookie? I guess when these darlings come out of the oven, and my daughter reaches for one. I will have to tell her............. "NO, YOU CAN'T EAT THAT! A Crazy Person made them!" 2 c. chocolate chips - plus extra of course to be strategically placed. With a cookie scoop, scoop out onto greased cookie sheet. Place your extra chips on each mound and bake at 350 for 10 minutes only.